Crushed Whole Cranberry, Blueberry, Raspberry, Strawberry Fruit Juice Drink Blend made with Apple and Grape Juices from Concentrate. 40 crushed whole cranberries per serve. Voted product of the year consumer survey of product innovation 2018. Whole crushed cranberries not from concentrate. Thicker than most juices. Thinner than a smoothie. Always delicious. 1 serving of fruit per 200ml. Rich source of antioxidant vitamin C. Source of fibre. No added sugar. No preservatives. Free from artificial flavouring and colour.Crushed Whole Cranberry Fruit Juice Drink Blend with Mixed Berry Puree Fibre 1 1 See fibre content in nutrition information panel. No Added Sugar 2 2 Contains naturally occurring sugars. Whole Cranberry, Not Just the Juice We crush whole cranberries into a nourishing, flavourful drink to help preserve the fresh taste and nutrients of the entire cranberry -not just the juice. 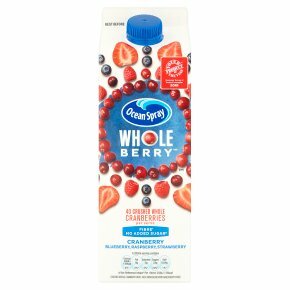 Nourishing Goodness Everyday 4 4 The 24mg of Vitamin C in one 200ml serving of Ocean Spray® Whole Berry? Crushed Whole Cranberry Fruit Juice Blend per day contributes to the reduction of tiredness and fatigue and to the protection of cells against oxidative stress, as part of a varied and balanced diet and healthy lifestyle. 40 Cranberries Per Glass 3 Paired with the juices of other delicious fruits, it creates a truly nourishing and wholesome way to start your day. 40 whole cranberries in every 200ml serve. 3 1 glass = 200ml serve.